For many people, recycling has become second nature. They don’t think twice about tossing and what about our soda can into a recycling bin. That’s especially true at home but recycling is also happening at schools, churches, shopping centers and most commercial buildings. If given the chance, then most people would recycle versus throwing something into the trash. 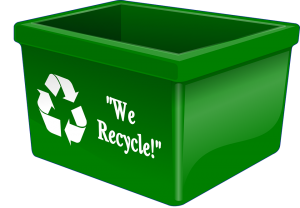 There are a lot of important facts about recycling that might help bring the concept into sharper focus. Even though recycling campaigns have proven to be effective, we still only recycle 25% of all the materials that could be repurposed. Still, that number represents an amount that has doubled in the last 15 years. If it keeps up, then many cities can hit the goal of achieving zero waste. It was only 20 years ago that a single curbside recycling program existed in the United States. How does recycling help the planet? When a ton of paper is recycled it can save up to 17 trees from being cut down. Consider that Americans use more than 67 million tons of paper each year. That’s a lot of trees. And paper products make up the largest part of our trash at around 40%. It’s also smart business sense. Making recycled paper instead of new paper uses 64% less energy and 58% less water. Those are savings that any company would be happy to embrace. Just how many trees are used to make all the raw materials for paper each year? It takes around 900 million trees for that purpose. That is way too many trees being cut down. The goal of any recycling program is to keep things out of a landfill. When something is left to rot in a landfill it begins to break down and can release toxic components into the environment. The other problem is that landfill takes up valuable space. And some of the trash isn’t going anywhere. For instance, an aluminum can that’s tossed in a landfill won’t break down for over hundred years. A plastic bottle takes around 700 years before it degrades. On the other hand, it only takes a few months before a recycled aluminum can is made into a new can and put back on the grocery shelf. If recycling is important to you and your family, then you don’t have to stop with your plastic bottles, soda cans and papers. You can recycle your junk to if you hire Junk King Atlanta to haul it away. Junk King Atlanta has been recycling the bulk of what they collect since they began operation. That makes them the perfect junk recycling partner. This entry was posted in Atlanta Junk Recycling and tagged clutter, Junk King, recycling on December 1, 2017 by Junk King. Last updated December 1, 2017 .